Two known species, the following, the generic type, occurring in North America, the other in Japan. 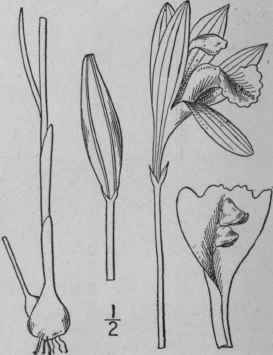 Arethusa bulbosa L. Sp. PI. 950. 1753. Scape glabrous, 5'-10' high, bearing 1-3 loose sheathing bracts. Leaf linear, many-nerved, becoming 4'-6' long; flower solitary (rarely 2), arising from between a pair of small unequal scales, rose-purple, 1'-2' high; sepals and petals linear to elliptic, obtuse, arched over the column; lip usually drooping beneath the sepals and petals, the apex broad, rounded, often fringed or toothed, variegated with purplish blotches, bearded, crested down the face in three white hairy ridges; capsule about 1' long, ellipsoid, strongly 6-ribbed, rarely maturing. In bogs, Newfoundland to Ontario and Minnesota, South Carolina and Indiana. May-June.